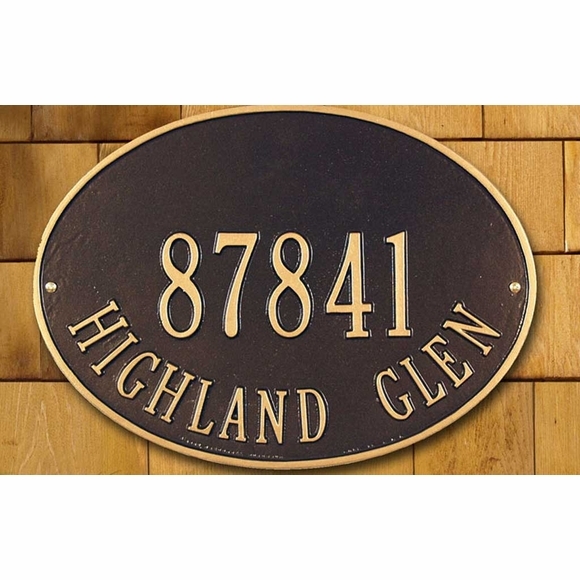 Hawthorne Oval Home Address Plaque - - standard size 14.25" x 10.25" personalized home address plaque with one or two lines of personalization. Made in USA. One-line plaque holds up to five 3" characters on line 1. Two-line plaque holds up to five 3" characters on line 1 and up to fourteen 1.5" characters on line 2. If you are ordering a 1-line plaque, please leave the Line 2 input box empty. This sign is also available with three lines of custom text (see Related Products).